© 2014 by The York Daily Record/Sunday News. 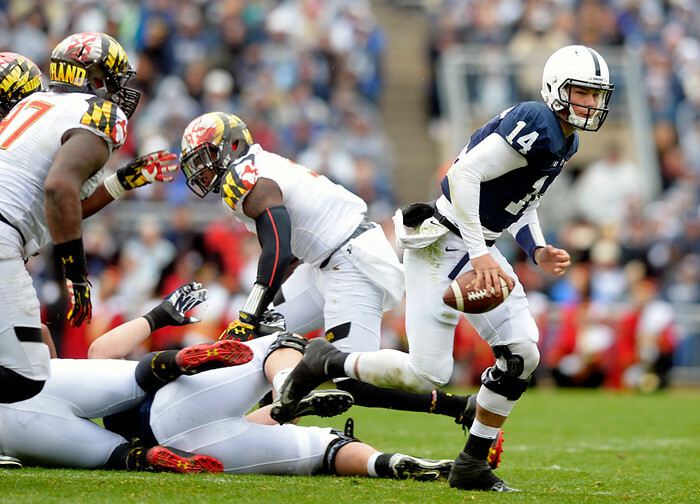 Penn State quarterback Christian Hackenberg carries the ball against Maryland in the first half of a Big Ten football game at Beaver Stadium on Saturday, Nov. 1, 2014. A newcomer to the conference, Maryland defeated Penn State 20-19 in the schools’ first meeting since 1993 to win the Terrapins’ first-ever Beaver Stadium victory. “Let the rivalry begin,” Maryland head football coach and York County native Randy Edsall told the press, referring to a decades-long but 21-year-dormant rivalry whose series Penn State continues to lead 35-2-1. © 2014 by The York Daily Record/Sunday News. 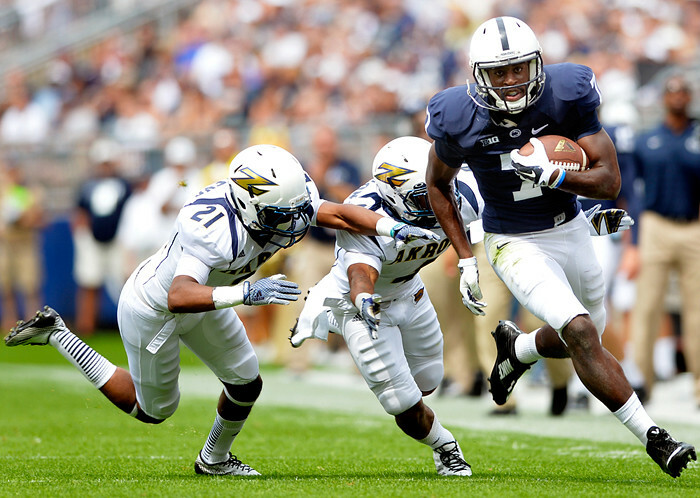 Maryland’s William Likely breaks up an endzone pass intended for Penn State’s DaeSean Hamilton in the first half of a Big Ten football game at Beaver Stadium on Saturday, Nov. 1, 2014. A newcomer to the conference, Maryland defeated Penn State 20-19 in the schools’ first meeting since 1993 to win the Terrapins’ first-ever Beaver Stadium victory. © 2014 by The York Daily Record/Sunday News. 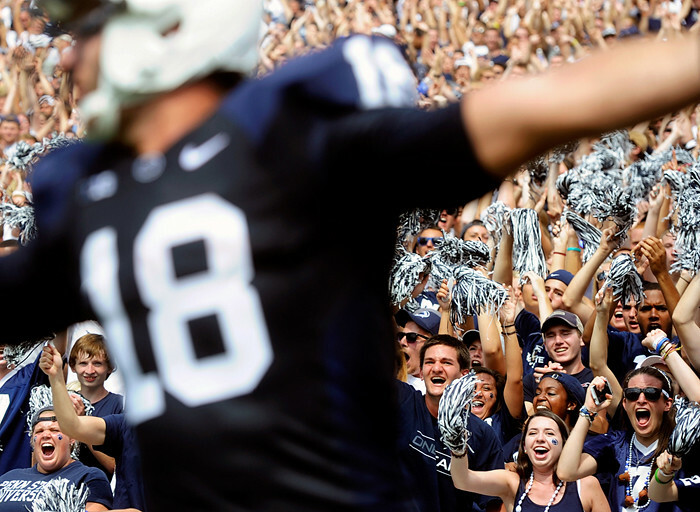 Penn State kicker Sam Ficken reacts after nailing a 46-yard field goal to give the Nittany Lions a 9-7 lead in the first half of a Big Ten football game at Beaver Stadium on Saturday, Nov. 1, 2014. A newcomer to the conference, Maryland defeated Penn State 20-19 in the schools’ first meeting since 1993 to win the Terrapins’ first-ever Beaver Stadium victory. © 2014 by The York Daily Record/Sunday News. 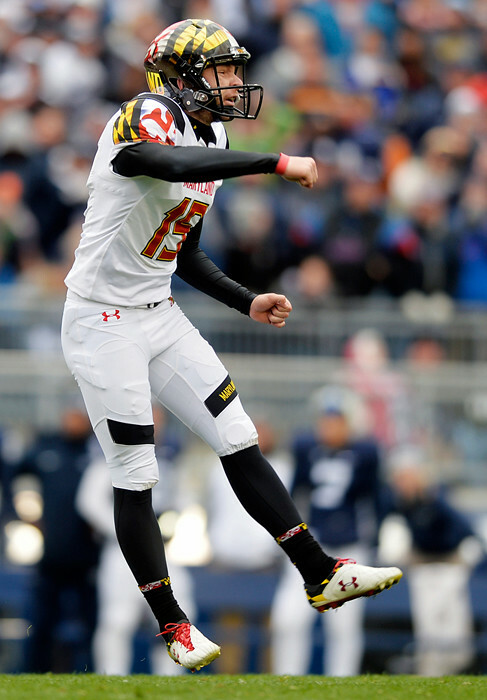 Maryland kicker Brad Craddock reacts after kicking a 43-yard field goal to win a Big Ten football game at Beaver Stadium on Saturday, Nov. 1, 2014. A newcomer to the conference, Maryland defeated Penn State 20-19 in the schools’ first meeting since 1993 to win the Terrapins’ first-ever Beaver Stadium victory. © 2014 by The York Daily Record/Sunday News. 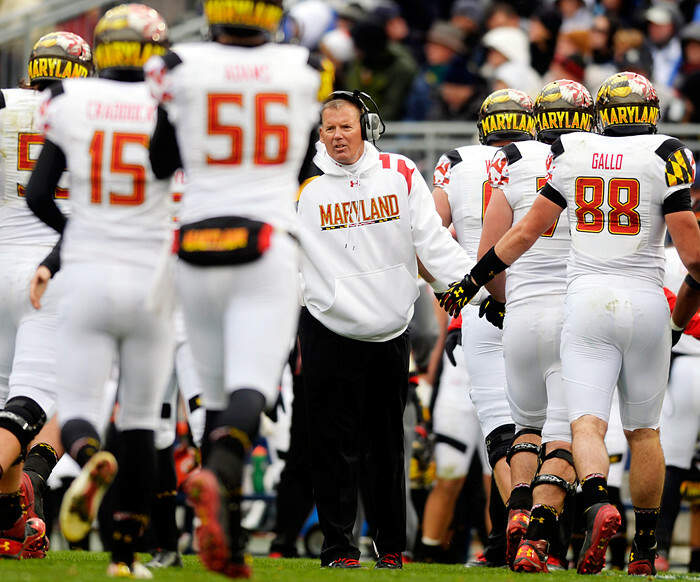 Maryland head coach Randy Edsall greets his players after quarterback C.J. 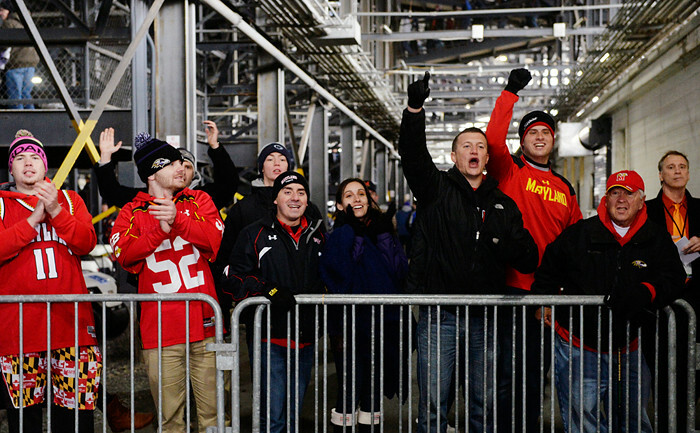 Brown scored a touchdown to give the Terrapins a 17-16 lead in the second half of a Big Ten football game at Beaver Stadium on Saturday, Nov. 1, 2014. © 2014 by The York Daily Record/Sunday News. 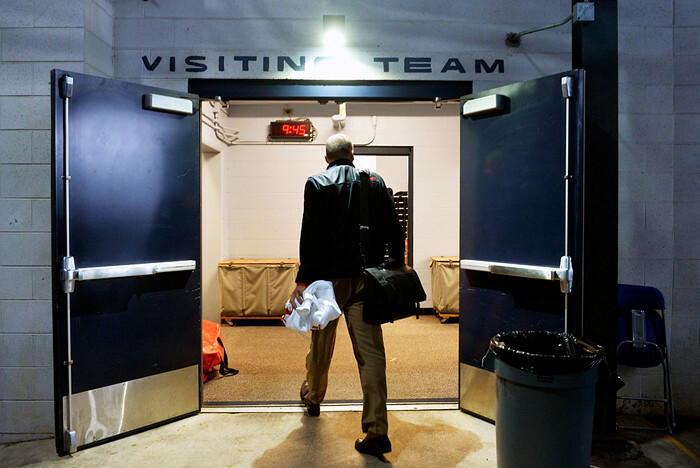 Maryland fans cheer as head coach Randy Edsall enters the visiting team’s locker room after winning a Big Ten football game at Beaver Stadium on Saturday, Nov. 1, 2014. © 2014 by The York Daily Record/Sunday News. 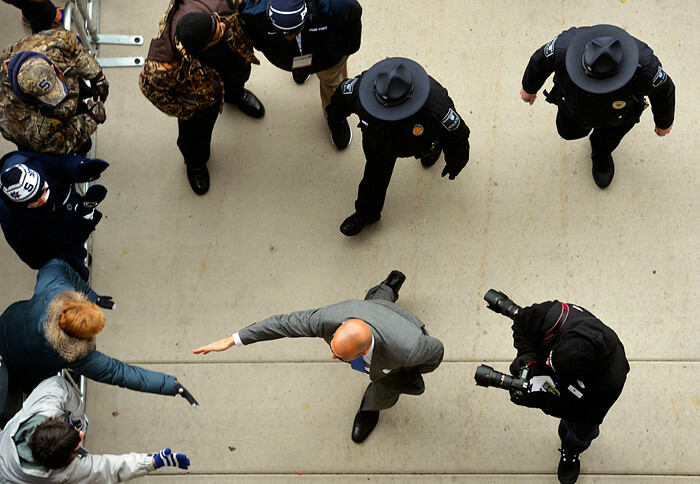 Penn State football coach James Franklin greets fans as the team arrives at Beaver Stadium on Saturday, Nov. 15, 2014. 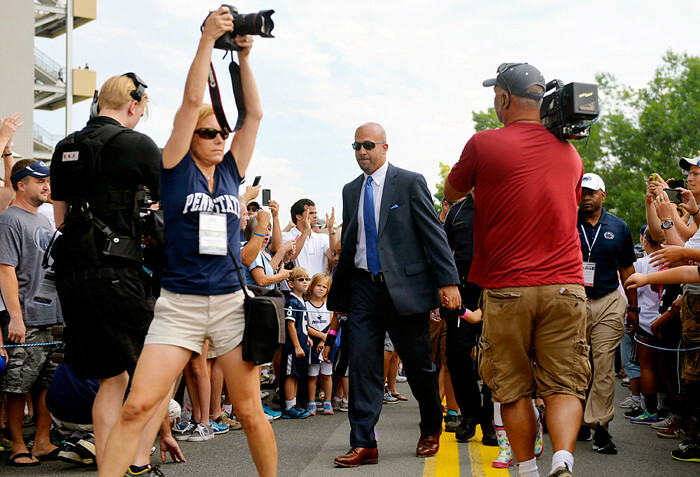 Penn State hosts Temple, which has not won a game in the series since 1941. © 2014 by The York Daily Record/Sunday News. Penn State’s Mike Hull brings down Temple’s Colin Thompson in the first half of an NCAA football game on Saturday, Nov. 15, 2014, at Beaver Stadium. 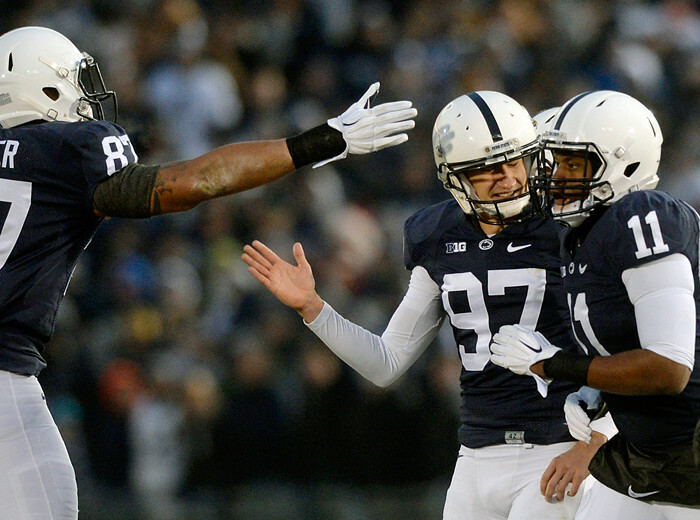 Penn State defeated Temple 30-13 and became eligible for its first bowl game since 2011. © 2014 by The York Daily Record/Sunday News. 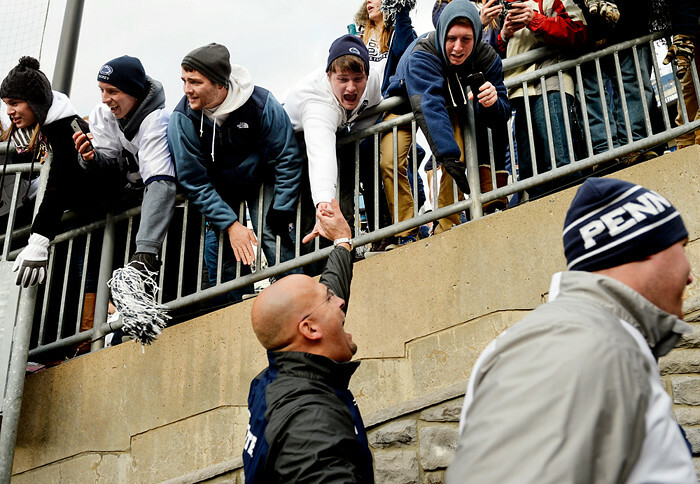 Penn State students greet head football coach James Franklin after an NCAA football game on Saturday, Nov. 15, 2014, at Beaver Stadium. 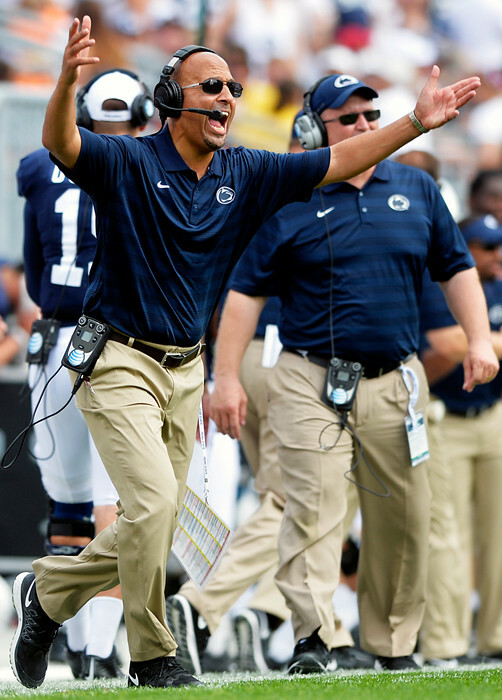 Penn State defeated Temple 30-13 and became eligible for its first bowl game since 2011. © 2014 by The York Daily Record/Sunday News. 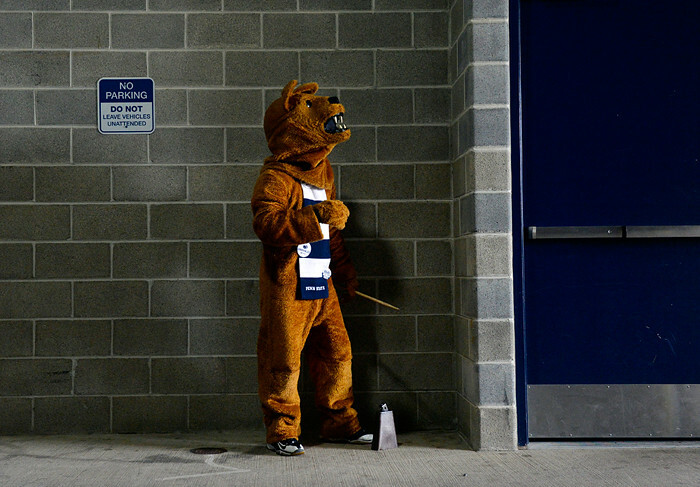 The Nittany Lion mascot waits inside the gate before greeting fans for the football team’s arrival on Saturday, Nov. 29, 2014, at Beaver Stadium. 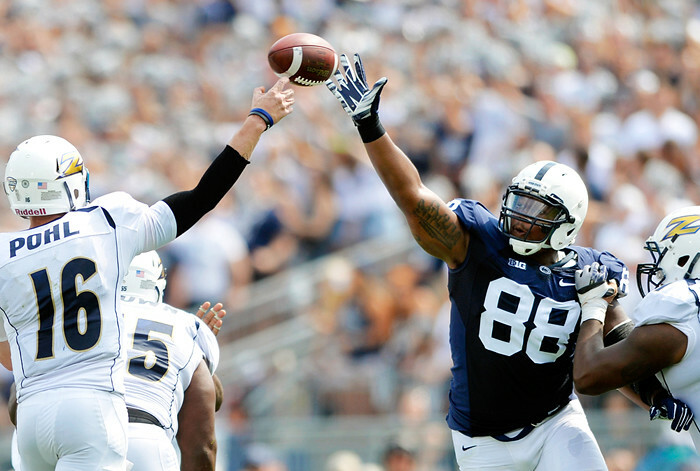 Penn State hosts Michigan State in the Nittany Lions’ final game of the 2014 regular season. © 2014 by The York Daily Record/Sunday News. 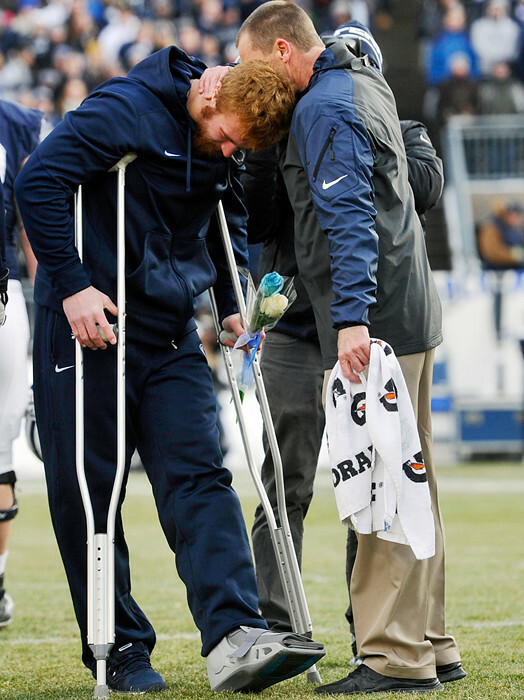 Penn State senior Zach Zwinak greets a staff member as he enters the field for the Nittany Lions’ senior ceremony before their final regular-season game on Saturday, Nov. 29, 2014, at Beaver Stadium. © 2014 by The York Daily Record/Sunday News. 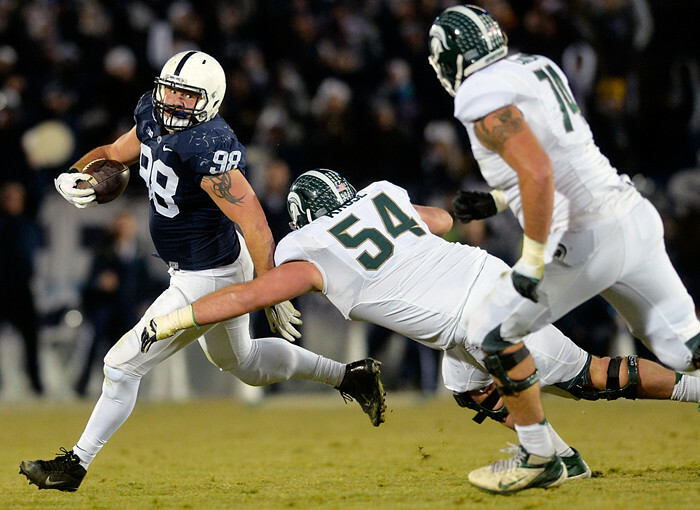 Penn State linebacker Anthony Zettel runs with the ball against Michigan State’s Connor Kruse and Jack Conklin after catching an interception in the first half of Penn State’s final regular-season game on Saturday, Nov. 29, 2014, at Beaver Stadium. Michigan State defeated Penn State 34-10. © 2014 by The York Daily Record/Sunday News. 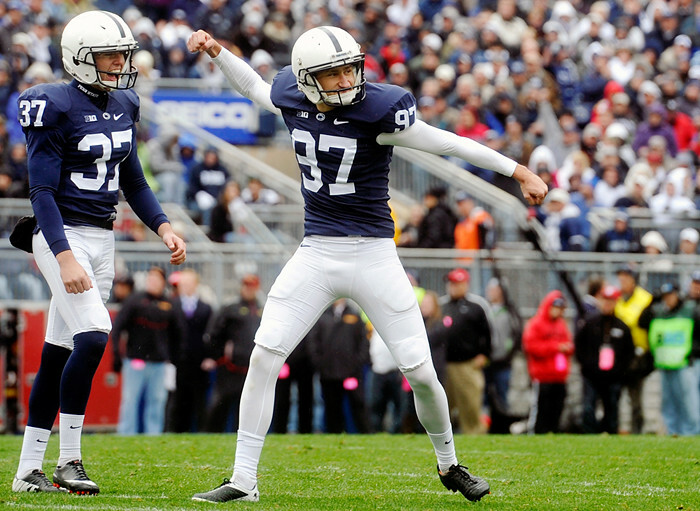 Penn State kicker Sam Ficken (97) celebrates after scoring a field goal in the first half of Penn State’s final regular-season game on Saturday, Nov. 29, 2014, at Beaver Stadium. Michigan State defeated Penn State 34-10. © 2014 by The York Daily Record/Sunday News. Michigan State’s Trae Waynes intercepts a pass intended for Penn State’s Chris Godwin in the end zone for a touchback in the first half of Penn State’s final regular-season game on Saturday, Nov. 29, 2014, at Beaver Stadium. Michigan State defeated Penn State 34-10. © 2014 by The York Daily Record/Sunday News. 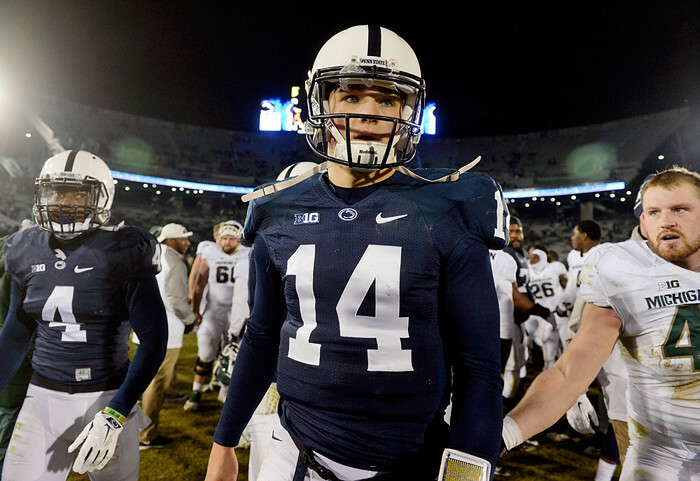 Penn State quarterback Christian Hackenberg departs the field after shaking hands with Michigan State players following Penn State’s final regular-season game on Saturday, Nov. 29, 2014, at Beaver Stadium. Michigan State defeated Penn State 34-10.